Researching the Little Kern Golden Trout? 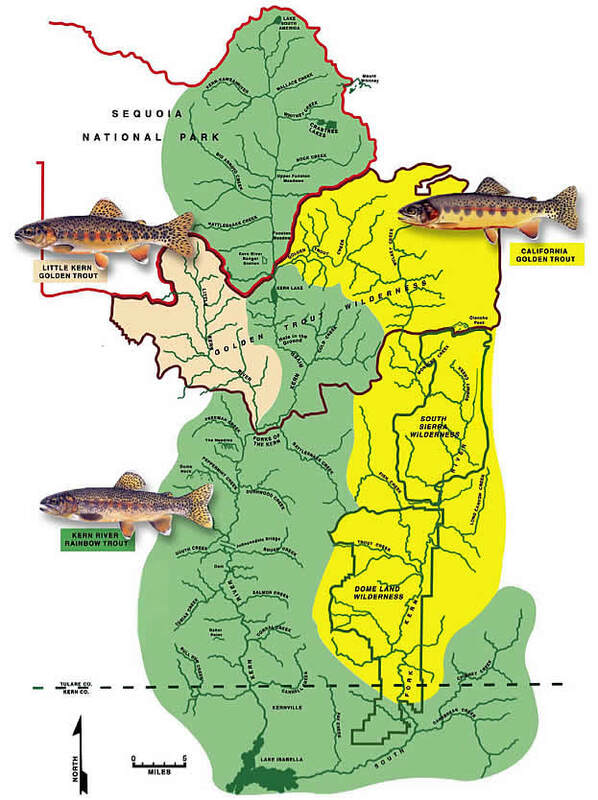 Get scientific based angling intel in The EcoAngler Report - Little Kern Golden Trout. Detailed information on it's range along with a map and directions to put you in reach of this native rainbow can be purchased here. An Adobe PDF document will be made available at the end of the purchase check-out. Select Return to the Ecological Angler to view your copy of The EcoAngler Report - Little Kern Golden Trout. The parr marks are arranged vertically on both sides of the body with an intermediate row of smaller ones often occurring just below the main row. The Little Kern golden trout native habitat is the Little Kern River (above the falls on the lower river) and the accessible reaches of its major tributaries in Tulare County. The Little Kern drainage occurs predominately within the Golden Trout Wilderness of Sequoia National Forest. A portion of the Little Kern drainage occurs in Sequoia National Park. Transplants and introgression with coastal rainbow trout have drastically altered this range. Later transplants of nonnative trout into the Little Kern River basin displaced the species from many of its historic habitats. The Little Kern Golden trout caught, photoed, and released in its native range qualifies for the California Heritage Trout Challenge. Scott Lyons also send me the above photo of a Little Kern Golden swimming off. Scott completed his Heritage Trout Challenge and is now helping friends on their quest for California natives. What is the Little Kern golden trout's native range? Send an email to the EcoAngler and I can recommend some waters to fish.